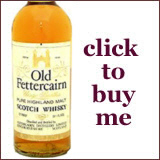 Fettercairn is one of the oldest licensed distilleries in Scotland dating back to 1824. It can be found in the east highland region mid way between Dundee and Aberdeen and has a visitor centre which is open May to September. The various single malts tend to be smooth and spicy, dry and sweet with excellent balance. The Fettercairn 1824 – 12 year old is malt smoothness in a bottle – hints of nutmeg and black pepper imbibing the creamy golden toffee. Why not relax with this! Fettercairn 10 is a favourite of ours from the 1980’s bringing back memories of barbeques and sunshine – ultra smooth with hints of sweet hazelnut toffee creaminess – definitely one for sharing with a close friend. Bin end sale currently with £5 off – very smooth and easy on the palate and the pocket! 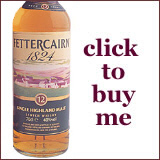 What Do You Think of 'Fettercairn Single Malt Scotch Whisky'? Rate It Below!